Just as their name suggests, cloakVPN is seemingly shrouded in secrecy. Is that good or bad? Find out below. No, we’ve not forgotten to center the screenshot. The website really does look like this on our browser. When you visit the cloakVPN website, you’ll immediately notice that they have that comic-like noir charm – think of something like Sin City or similar, and you get the idea. It’s a barebones website – it’s not even responsive to our browser window size, as you can see above. Their website might be devoid of style and complex CSS, but do they have what it takes to be worth your dime when it comes to their service? There’s an ever-increasing need and demand for data protection and one of the best ways to protect your data is to invest in a VPN. It’s crucial you get to know and are able to trust a provider before you put your internet browsing data in their hands. Is there more to this VPN? Let’s find out in this review. Users can subscribe to cloakVPN and pay them using PayPal, credit cards, Bitcoin, and various other modes of payment. We always check to see if a VPN service provides payment options in cryptocurrency, so they pass the test on that front! cloakVPN has one of the most straightforward VPN privacy policies we’ve seen. Unlike most VPN services that have tons of verbose paragraphs written on their privacy policies, cloakVPN only has 6 sentences in theirs. Those six sentences cover everything a VPN user wants to hear. Surprisingly good, considering what we’ve said in the rest of this review. cloakVPN is an OpenVPN tunnel service and uses the OpenSSL library to encrypt data and control channels. OpenVPN’s protocol can be trusted to secure user information. cloakVPN’s service is compatible with Windows, Mac, iOS, Android, and Linux. It does not support other devices beyond that such as routers or smart TVs. cloakVPN needs to be configured on OpenVPN clients. It does not offer native apps for any of the platforms. Their plans are already located on their homepage. If you’re done with deliberation and you’re ready to purchase either their monthly or yearly plan, just click the payment method you want to use, and after that, you should be redirected to another site where you can get your login credentials. Unfortunately, we were led to a page error and only got this far. cloakVPN only offers 1 server and that’s their United States server. To summarize our experience with cloakVPN in one word: horrible. We tried to subscribe to their service via PayPal but weren’t able to make use of their services. After paying cloakVPN via PayPal, we were redirected to this page. After waiting for a few seconds, we were redirected to another page. Even after clicking the “click here” button on the PayPal page, we were still redirected to the same page. Since cloakVPN is an OpenVPN tunnel service, OpenVPN requires a username and password before being able to use a certain VPN service. But because cloakVPN didn’t provide us with a username and password, we didn’t have the chance to try their VPN. We are not sure if this tunnel service is able to get through Netflix because we weren’t able to connect to them. Looking to access Netflix? Find out the best VPNs for binging your favorite shows. We weren’t able to check if the VPN could download torrents due to their website’s failure to redirect us. Looking to get your P2P fix? Find our best VPNs for torrenting here. cloakVPN gives users 4 options when choosing how they want to use their service. They have a VPN only and a VPN and proxy plan. 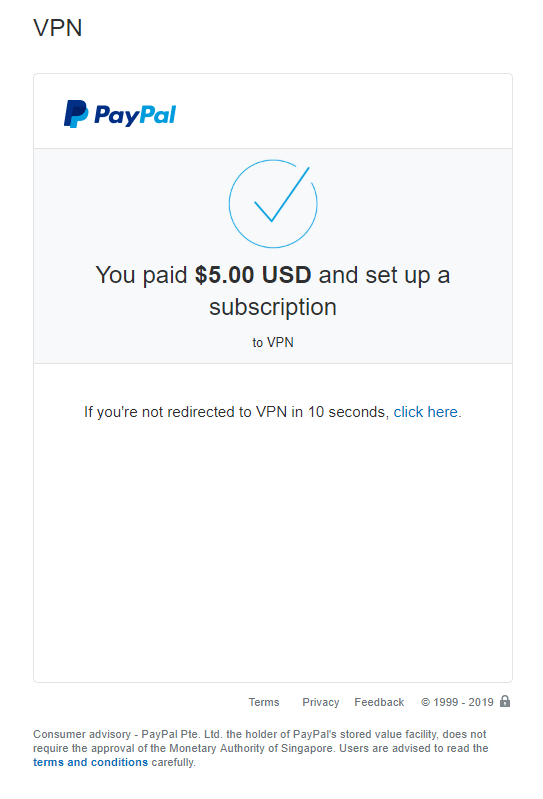 The VPN only plans cost $5 per month and $30 for 6 months. Meanwhile, the VPN and proxy plans cost $10 per month and $60 for 6 months. If you do the math, there’s no advantage you get by paying 6 months in advance. No discount, no bulk pricing. Considering the quality of the service so far, paying this much (or indeed, anything at all) is a bit of a joke. cloakVPN doesn’t have a refund policy. Sadly, we might have lost $5 to a defunct VPN. Expect to say goodbye to your money, unless PayPal backs you up for a refund. Their website is severely out of our screen’s orientation. It’d be likely that the same thing will happen to you, too. Based on that alone, we wouldn’t expect much from their app; if they’re not willing to put effort into the website, it’s unlikely their software is much better. To be frank, their customer support isn’t worth bothering with, if you have decided to subscribe. Their FAQ page barely had answers to important questions. cloakVPN’s email address isn’t easy to spot, either. We found it hidden at the bottom of the page inside the Bitcoin tag – again, more evidence of cloakVPN’s lack of attention to detail. We sent an email and we still haven’t received a reply as of writing. Overall, very very disappointing. Like we said before, their FAQ page is minimalistic to say the least. It only answers one question. They do not have a knowledgebase. It’s sad to say that since the VPN failed to redirect us, we weren’t able to actually connect and run the IP and DNS leak tests. The tunneling service does not have a kill switch. This is often true for OpenVPN service providers. Details on the creators of cloakVPN are nowhere to be found. Most VPNs have a page dedicated to the creators and history of the VPN, but cloakVPN isn’t like most VPNs. They lack a page about their creators and have no information about their company. They do have a Twitter page that was created in 2011. Tweets are often in Russian and Chinese if that’s any clue. “Cloak VPN” gets a significant amount of searches on Google – we were left questioning why. It turns out, Encrypt.me used to be Cloak VPN and an imposter may have taken a similar domain name to hitchhike off the leftover searches. You won’t find any information about the VPN. They give details really sparingly. They only claim to offer servers that are based in America and if they are based in America, like most VPNs of their league, this means they’re part of the mass surveillance alliance, 14 Eyes Alliance. We can’t exactly rule out the possibility of them handing out user information if authorities ever solicit it from the VPN. Members of the 14 Eyes alliance exchange information to all their 14 members and other partners. If you’ve read this far, you already know we’re going to recommend you stay far away – the risk of your data being distributed is the final nail in the coffin of this review. Do you really need to ask? If you’ve skipped the review, and come for the TL;DR, here it is. Avoid cloakVPN. There are very few things to say about the service that are positive, and much of that is due to the fact that we paid for a service we didn’t receive. The other aspects, like their customer support and extremely poor design, are things we can see but weren’t impressed with. The few positives like security, logging policies and payment options do not outweigh an otherwise abysmal VPN service. If you’re looking for something worth your time and money, check out our top VPN recommendations.